Designer Vivian Chiu had this to say about her Inception Chair. 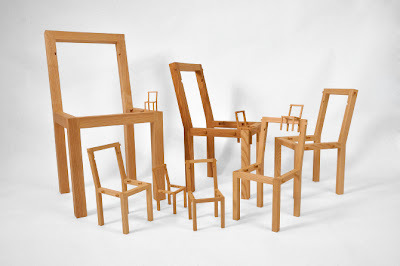 "Taking the chair archetype and placing within it chairs that are progressively smaller. Each chair has hand cut grooves on the inside edges of its seat frame as well as notches in the seat back. These grooves range from 1/2” wide to 1/8” wide. The mechanism works so that the pegs fit into the grooves of the chair one size bigger and slides into place so that the horizontal edge between the chair seat and back line up. 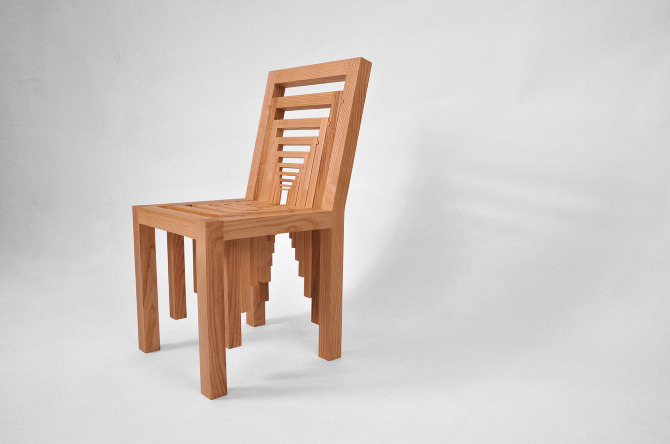 The simple mechanism allows the chairs to be taken apart and put together with ease."